The Golden State leads the world in technology, but is hardly a model in handling its own water resources. By now, many Californians are seasoned in the skills of household water conservation. Deep into a fourth year of drought, we have let our lawns turn brown and we’re taking shorter showers. The state’s water leaders are addressing the challenge with water cutbacks in cities, planning desalination and wastewater recycling plants, and ramping up a program to improve groundwater management. But California is behind the global curve when it comes to building and operating reliable water supply systems. “Everything that you can do wrong [in managing water] has been done in California,” says David Zetland, a water policy author and assistant professor of economics at the Leiden University College in the Netherlands (and also on the Water Deeply board of advisors). Rivers have been drained to support cities and farms in the desert, he said. Groundwater use is entirely untracked. And state officials have allocated more water from California’s rivers and streams than actually exists. Other nations, stressed by their own water supply issues, have meanwhile emerged as leaders in an arena where California must now play catch-up. About a third of Singapore’s water is provided by sewage treatment plants. Israel has dealt with intense drought by investing heavily in desalination plants and water recycling. Australia and Chile are leaders of sustainable agricultural water management, largely via sophisticated water markets. One of the biggest flaws in California’s water system is that the state does not manage groundwater use. Aquifers are a free-for-all where anyone with a well can withdraw all the water they want. As a result, groundwater reserves are shrinking – so dramatically that the Earth surface in parts of the Central Valley is subsiding by 2 inches per month, causing roads and canals to buckle and resulting in permanent loss of groundwater storage space as deep soil layers collapse. California’s environmental regulations are showing their weaknesses, too, as imperiled fish species – including Chinook salmon – are pushed toward the brink in the Sacramento-San Joaquin Delta. There, demand for water has had particularly visible effects on fish populations; species extinction is a real possibility as the drought continues. Solving California’s water woes could be done, many water policy analysts say, by implementing a water market, where users pay a market rate, without subsidies, for every drop they use. Under the state’s current system, the biggest users – such as corporate farms – often pay the least for water, with users on municipal systems paying vastly more. Direct comparisons are tricky, because urban water systems require more expensive infrastructure. But to put it differently, the present system is like charging higher gasoline prices to drivers of fuel-efficient cars and offering discount rates to drivers of gas guzzlers. Reversing this subsidized water supply system would create incentive for urban and agricultural users to conserve water. Farmers in a water market system would give more consideration to what crops they are growing and where, and many growers might abandon especially arid regions, where irrigation needs are greater. Lester Snow, former director of the California Department of Water Resources and also former secretary of the state Natural Resources Agency, stresses such a system would have to be fair. 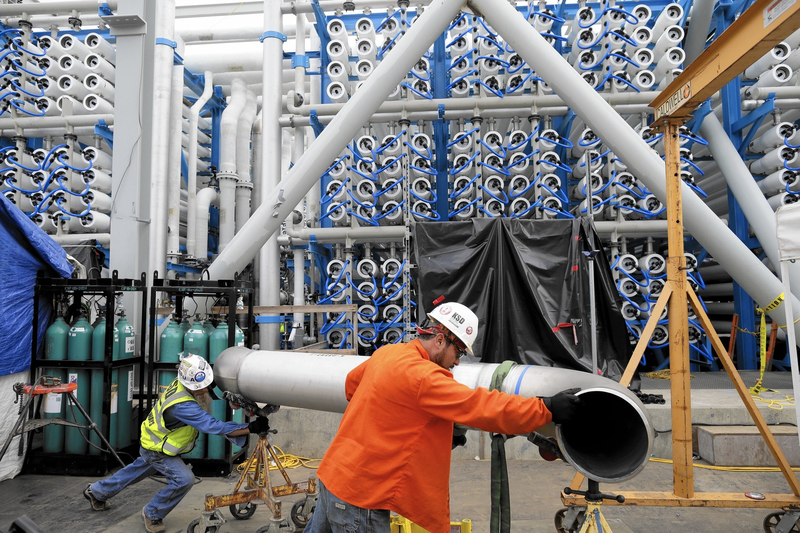 Workers move a pipe at the Carlsbad desalination facility under construction in San Diego County. In the background are thousands of reverse osmosis vessels that will extract the salt from seawater. When finished this fall, the plant will be operated by an Israeli contractor, because California lacks the expertise in its own workforce. Associated Press photo by Gregory Bull. Another prerequisite for a functioning water market is that groundwater use must be managed and tracked just as surface water is. Otherwise, Snow cautions, a system that encourages buying and selling of water would accelerate a practice known as groundwater transfers, or substitutions, whereby farmers sell their surface water and then irrigate their own crops by simply pumping more groundwater. The water market of Australia, a nation plagued by chronic drought, has become a model of efficiency. Mike Young, professor of water and environmental policy at the University of Adelaide, says the nation made “massive mistakes” in the handling of its water. “Some of the things that went wrong were not managing our groundwater properly and not understanding the link between ground and surface water,” Young says. In many situations, groundwater is just the subsurface extension of a river or lake. This means it is ineffective to restrict direct pumping from the surface supply if you also continue to allow unrestricted pumping from nearby wells – as California does. 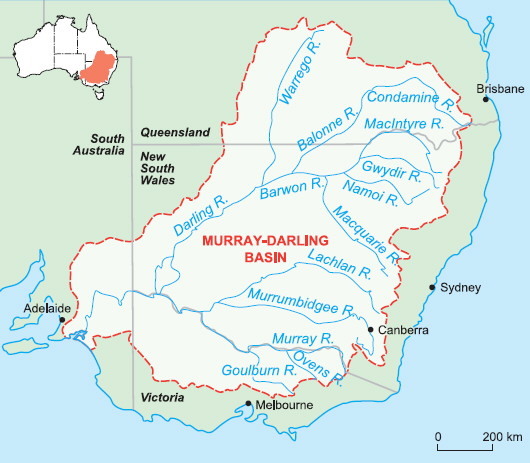 Over a period of several years, says Young, Australia’s water management system was overhauled and is now considered one of the most lauded in the world. “Water is handled like money,” Young says. “Everyone has a water account, almost like a bank account.” Registered permit holders can buy and trade water as shares, with all transactions carefully tracked. Caps on surface and groundwater use are also firmly enforced to protect baseline environmental needs. “Anyone who takes water without a water right has the books thrown at them, and we have water bailiffs going around continuously to make sure people are complying,” Young says. “Farmers understand that if someone is taking water without an allocation, they’re stealing from their neighbors.” The system also prompted farmers to change how they operate and what they grow, Young says. United States leaders have taken note of other nations’ efficiency in water management. Nevada recently called on Young to counsel the desert state in drought adaptation strategies. In June, California hosted several Israeli water experts in Sacramento to offer guidance on the Golden State’s water crisis. Californians have also gone abroad seeking ideas. Dave Feldman, a professor at U.C. Irvine’s School of Social Ecology, has visited Melbourne, Australia, three times in the past two years with a group of colleagues and students to study the way cities use and handle water, and to explore whether these practices could be imported to the U.S.
Feldman says Australian urbanites have adapted to drought in rather simple ways. “Most of the changes that have been made in Australia regarding water and managing the drought have been behavioral changes, not so much technological changes, or economic changes,” he says. Feldman observed widespread use of water recycling programs, gray-water recapture for irrigation purposes, rain catchment and storage systems. Wetlands have also been preserved as biofilters for stormwater runoff. Feldman says there are barriers – he calls them “societal apprehensions” – that could keep these ideas from rooting in the U.S. For example, using recycled gray water to irrigate lawns or installing rainwater storage tanks creates liability risks if people drink the water – risks Australians as a culture have learned to accept in a way Americans have not. Snow says the U.S., and especially California, shouldn’t necessarily need to look overseas for innovative approaches to drought adaptation. “All the best solutions are already happening in parts of California,” Snow says. “What we have to do is just get those solutions to scale.” He says gray-water reuse, wastewater recapture and recycling, and the flooding of agricultural land to recharge groundwater all exist now in California and should be practiced more widely. Other countries, he adds, are not more innovative; they have simply employed their innovations more efficiently than California has. Australian wineries have done this in part by optimizing the way facilities operate. In particular, they are adept at capturing and reusing water – mostly for cleaning equipment – multiple times before it goes down the drain. Israel has done this by embracing seawater desalination, which now meets about half the nation’s water needs. Recycled urban wastewater meets much of Israel’s agricultural needs. The United States lags in water recycling, reclaiming and treating less than 1 percent of all urban wastewater. California is only beginning to test the waters of desalination. A new plant in Carlsbad, in San Diego County, took three years and a billion dollars to construct. Yet it will be managed initially by an Israeli company – IDE Technologies – because sufficient expertise doesn’t exist yet in the California workforce. When it finally goes online this fall, it will pump enough fresh water into a 10-mile pipeline to support the daily water needs of 300,000 people. But not everyone believes desalination is the answer to California’s water woes. “Desal is not a panacea,” Snow says. Rather, he characterizes desalination plants as “boutique” solutions – technology that may work in some locations but which, if built everywhere, would cause more problems than it solves. The biggest drawbacks of desalination plants are the cost of building them and their intensive energy demands. Zetland is among those who think desalination is a counterproductive measure. He says the Carlsbad plant could simply not have been built at all if the region’s users just consumed less water. Mike Lee, public affairs officer with the San Diego County Water Authority, says the region has already made substantial cutbacks in potable water use. But the locals who will soon drink that desalinated water still consume about 150 gallons per person per day – two or three times as much as people in parts of northern Europe, Australia and even Northern California. “In San Diego, they need the desalinated water, for what – to water their lawns?” Zetland says. The real irony of the Carlsbad desalination plant, Zetland adds, is that its cost is being distributed across three million rate payers, not just the people receiving its water. It’s a technique called postage stamp pricing, he said, that effectively hides the cost. “If they charged people the actual price of the desalinated water, people would use so much less water that they wouldn’t even need the desalinated water,” Zetland says. Not all drought-stressed nations have excelled past California in conservation and efficiency. Spain and Saudi Arabia have both overplanted crops in regions with inadequate surface water supplies, driving overdrafting of groundwater – exactly what California has done. China is voraciously consuming its water resources. The developing super-economy is now damming and diverting rivers at an alarming rate. Roughly half the world’s dams have been built in China, and plans are unrolling to build many more. California, Snow says, is lagging for no reason except that the state is relatively young and has not, until now, felt the pressures that Australia and the Middle East have. California happens to be located at a very unique convergence of latitude, ocean currents and geological structures that have made it possible to develop a major economy in an arid land. Large rivers run through deserts in California, and some of the highest mountains on the continent loom over some of the most arid valleys, their peaks buried most years in snow. But that easy availability of water, at least for now, is gone. Alastair Bland is a freelance journalist in San Francisco, CA. He can be reached at allybland79@gmail.com or via Twitter at @allybland. Top Photo: Jorge Vargas, a foreman for Maggiora Brothers Drilling Inc., poses for a photograph while drilling an 800-foot-deep water well at an almond farm in Chowchilla, California, on Friday, April 4, 2014. In California’s drought, well drillers are experiencing a boom in business because farmers are relying more on groundwater to irrigate their crops (by Scott Smith, Associated Press).